The Youth Justice Program works to nurture young people’s visions for change. Through the Youth Justice Program members plan and carry out their own campaigns: The Trauma Care Campaign and the Restorative Justice Reinvestment Campaign. The Restorative Justice Reinvestment Campaign is a campaign to develop the leadership of youth impacted by juvenile detention to close the Juvenile Detention Center and replace it with alternative programs in the neighborhoods where youth are get locked up. The Trauma Care Campaign advocates for the development of a trauma center on the South Side. The Youth Justice Program began in 2007 when tenants involved in STOP’s housing work began thinking about how they could engage their sons and daughters around issues that directly affect youth. With that goal in mind, STOP launched a community organizing summer internship program. Over the course of the program the youth developed their own organization. During the first summer internship program, participants were outraged by stories from friends and family about escalating violence, abuse, and neglect inside the Cook County Juvenile Detention Center. In response to these conditions, we joined forces with another youth organization, Generation Y (Gen Y) of the Southwest Youth Collaborative to launch a project to pressure the center’s administration to establish humane conditions in the detention center, and reform the juvenile justice system by developing community- based alternatives to child incarceration. We organized a press conference outside of a Cook County Board meeting where they delivered 100 pairs of underwear for Audy Home residents (who were being denied clean underwear) and demanded immediate humane conditions. Though our gift was never delivered, the staff immediately responded by providing the youth with clean underwear. We also conducted a research project documenting abuses in the Detention Center through interviews with former detainees, which they compiled with outside research. They shared their findings at a teach-in attended by the Detention Center director. At the teach-in we were granted regular monitoring tours of the Audy Home. Youth leaders conducted tours and meet with detention center administration to learn about the juvenile justice system and push for reforms. We also built relationships with people key to implementing reforms. As we learned about reforms we became exposed to Restorative Justice as an alternative to detention and incarceration and began advocating to expand it and implement within our organization. In 2014 - 2016 we teamed up with the Community Renewal Society to win a commitment of a $1M of funding for Restorative Justice alternatives. In the summer of 2010, Damian Turner, a youth leader, was shot and killed in the crossfire of a drive-by. Damian was taken past the University of Chicago Hospital—only three blocks away—to Northwestern Hospital, where he died. Young people discovered that the reason he was taken so far is the lack of a trauma center on the south side of the City. In response to his passing, we started a project to get a trauma center on the south side. Damian's death touched every part of the community and brought many people together. Over the next few years we organized a coalition, the Trauma Care Coalition, which now includes: Kenwood Oakland Community Organization, Students for Health Equity, Jewish Council of Urban Affairs, National Nurses United, and the Interfaith Leadership Committee. 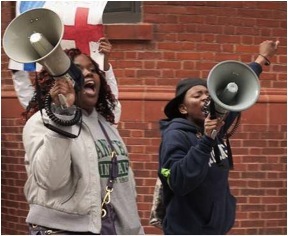 After a five-year direct action organizing campaign the Trauma Care Coalition succeeded in winning a commitment from the University of Chicago Hospital to open up a trauma center on their south side campus. We are now organizing to ensure community input and accountability in the development of the trauma center.